When a tooth is damaged from decay or broken after an accident or trauma to the mouth, it’s important to have it addressed by a dentist. Not only can a broken or decayed tooth cause pain and make you feel self-conscious, a weak tooth is at risk for further damage or infection. Dr. Vickii Bingham-Lester in Crofton, MD, understands that when a tooth is broken or damaged, patients want it fixed as quickly as possible. That’s why she offers same day dental crowns using advanced technology. Dental crowns are a dental restoration used when a tooth is badly damaged or decayed, past the point that a filling or cosmetic bonding can repair it. 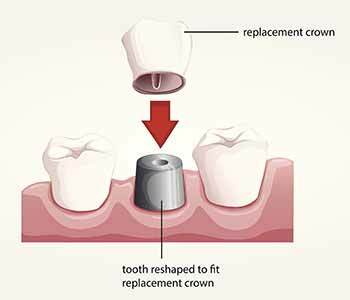 A crown, also known as tooth cap, covers the visible area of the tooth. Crowns are created using a tooth-colored material and can be customized to the exact specifications of the dentist so that it matches the teeth perfectly. Once the crown is placed, the tooth will function and look exactly like it did before the damage occurred. Patients can eat their favorite foods, smile confidently, and speak clearly. In many dental offices, the process of receiving a dental crown requires a couple of weeks, and two visits to the dentist. In the first, the dentist will examine the tooth, determine if a crown is the best treatment, prepare the tooth for treatment by removing the damaged structure and a small amount of enamel, and then take x-rays and impressions. The impressions and specifications for the crown are sent to a dental laboratory where the crown is created. Once the crown is ready, the patient returns to the office to have it placed. However, with Bingham-Lester Dentistry, the crown can be created in the dentist’s office while the patient waits. With advanced CEREC technology, Dr. Bingham-Lester offers her patients the benefit of receiving a crown in one dental visit without waiting for a laboratory to create the restoration. This offers convenience, speeds treatment, and removes any self-consciousness the patient might feel while wearing a temporary crown. Bingham-Lester Dentistry is centrally located on Route 3 North near the new Chick Fila. For more information about same day dental crowns, call Bingham-Lester Dentistry at 410-885-6522.